Princes Bridge, originally Prince's Bridge, is an important bridge in central Melbourne, Australia that spans the Yarra River. It is built on the site of one of the oldest river crossings in Australia. Construction on the new bridge began in 1886 and was completed in 1888 in time for the second International Exhibition to be held in Melbourne. By that time the Yarra River had been heavily modified both upstream and downstream and the major floods of the early years were becoming less common. Constructed by David Munro to a design by Jenkins, D'Ebro and Grainger, it replaced an earlier timber bridge designed by Scottish born bridge designer David Lennox, whose earlier bridges in Sydney include the Lansdowne Bridge and Lennox bridge in Parramatta. John Grainger (1855-1917), the father of the Australian composer Percy Grainger, did the majority of the design work for the bridge, which was opened on 4 October 1888. 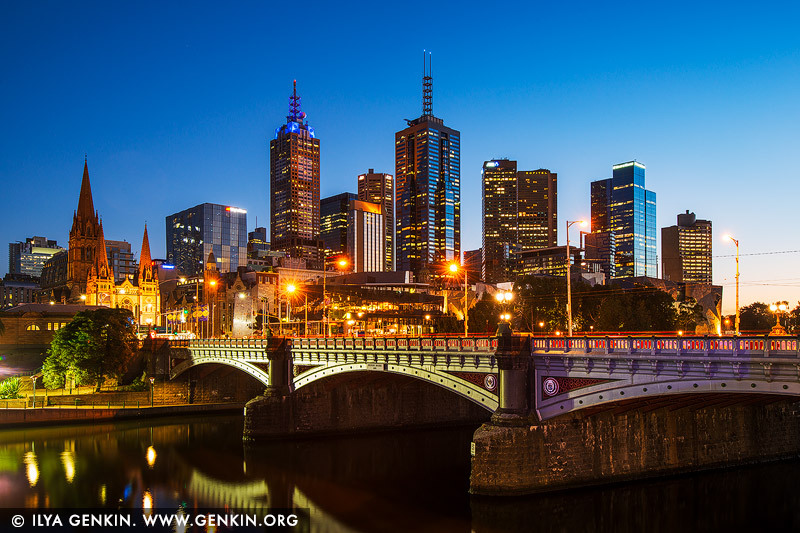 This image id AU-MELBOURNE-0041 of Melbourne, Princes Bridge and Flinders Street Station at Dawn, is copyrighted © by Ilya Genkin. This is not a public domain image.